As part of the G-BiB the student teams are educated in pitching, PR and business plan writing during a national masterclass. The German masterclass will take place at the CLIB office in Düsseldorf. As part of the G-BiB the student teams are educated in pitching, PR and business plan writing during a national masterclass. The Belgium masterclass will take place at the Bio Base Europe Pilot Plant near Ghent. In this event, organized by CLIB, experts will present innovative progress in light driven bioconversion of C1 feedstocks. This one-day workshop, organized by the H2020 FALCON project, offers the opportunity to listen to and network with experts in biorefinery strategies for biomass treatment and its upgrading. This week the partners of the BIG-Cluster project CROSSBEE met for a final project meeting to evaluate the first Massive Open Online Course (MOOC) ever produced by a consortium of nine partners. They decided on re-running the course and providing the publicity with all material for free. 26 participants from Germany and Belgium came together in Düsseldorf for the first meeting of the 2019 G-BiB. Four teams from Germany and three teams from Belgium will take the chance to learn about business plans, pitching and communication and will compete to win the final award in September 2019. 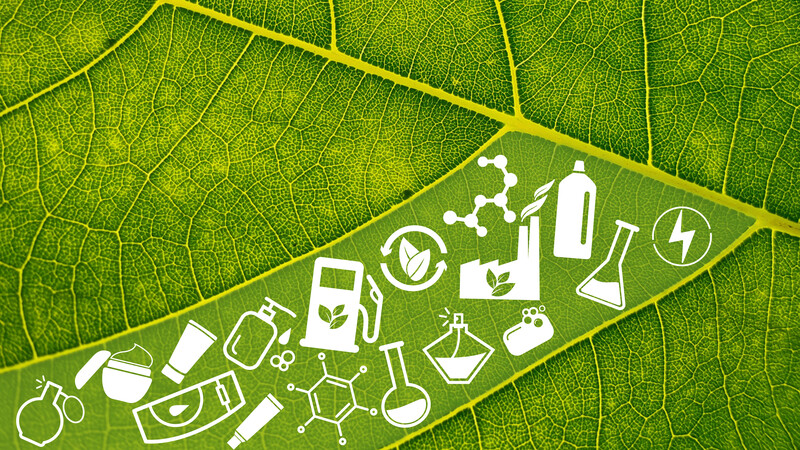 The MOOC on biobased products produced by nine partners from the BIG-Cluster region has started on 16 January 2019. More than 1400 students from all over the world can now listen to experts in bioeconomy and discuss with other learners about how to built a sustainable economy. The seven modules will be opened up one after another until 06 March 2019, when the course will end. Learners interested in signing in, are still very welcome, as all modules will stay open until the end of the course. Find out more and sign in! The joint MOOC produced in the BIG-Cluster project CROSSBEE - CrossBorder BioEconomy Eductation - is now online and free for registration. In this 7 week course the learners will find out what it takes to produce a sustainable product made from biobased resources and what to consider when bringing this product to the market. Nine different institutions from the three BIG-Cluster countries were involved to produce the first ever MOOC on basic knowledge about bioeconomy. The MOOC can be attended for free. Recently, Biorizon co-initiator and BIG-Cluster partner VITO has launched the EFRO LignoValue Pilot project. By Q1 2021, this € 4.3 million project must result in a functioning pilot line in Flanders for the production of bio-aromatics from lignin/wood. The pilot meets the needs of various companies that have expressed an interest in innovative molecules and a willingness to carry out application testing..
Over the next three years, the eight project partners Axxence, CLIB2021, Fraunhofer CBP, KU Leuven, LXP Group, Phytowelt, UPM and VITO join forces to develop “Aromatics from LIGNin”. Phenolic resins will be applied for the production of high-pressure-laminates as well as natural vanillin for food and beverages. The German project partners will receive 1.3 m EUR from the Federal Ministry of Education and Research (BMBF). The new project BioCOnversion unites multidisciplinary expertise from academia and industry in a cross-border consortium to make CO-containing process gases available for the production of added-value chemicals. The German Federal Ministry of Education and Research (BMBF) funded € 1.5 million to develop an innovative bioprocess to convert syngas into a defined plastic precursor by evaluating different technology approaches. The three years project coordinated by the open innovation cluster CLIB2021 has been kicked-off end of May 2018 and is element of CLIB’s internationalisation strategy within the cross-border BIG-Cluster initiative of the regions of the German state of North Rhine-Westphalia, the Netherlands and the Belgian region of Flanders. The BIG-Cluster Stakeholders Meeting, held on 12 June in Eindhoven, illustrated the vivid knowledge exchange and cross-border collaborations under the umbrella of the BIG-Cluster. Diverse innovation projects bring together high-level experts from Flanders region of Belgium, The Netherlands and the German state of North Rhine-Westphalia in the value chains “Aromatics from woody biomass”, “C1 gases to chemicals”, “Aviation fuels from various feedstocks”, and the horizontal topic “Circular economy education”. „The BIG-Cluster initiative has started in 2013. Today, we look back on a success story as the 10 project pitches have impressively demonstrated. They build a sustainable base to expand the close collaboration of the three BIG-Cluster regions.” said Willem Sederel (Biobased Delta), as the chair of the day. 100 experts from large companies, SMEs, academic institutes and universities as well as networks, attended the matchmaking event and developed roadmaps on the BIG-Cluster value chains “Aromatics from woody biomass”, “C1 gases to chemicals”, and “Aviation fuels from various feedstocks” in parallel workshops. According to Luuk van der Wielen (BE-Basic) “we do not have much time to develop the bio-based economy towards scale-up because of the rate of global warming and the scale of the transition.”, the participants agreed that all stakeholders need to work together and build new value chains supported by the government(s) to facilitate large investments. Ludo Diels (VITO) emphasizes the three regions will benefit from the bio-based economy. Developments will speed up if we manage to make the borders vanish and create new value chains in Europe. The meeting revealed starting points for new collaboration topics and cross-border research & innovation projects. The cross-border activities under the umbrella of the BIG-Cluster will be intensified in the future. The next Stakeholders Meeting in 2018 will further foster biobased economy in the BIG-Cluster region. After a successful kick-off of the Global Biobased Business Competition (G-BiB) involving German and Dutch teams, which had previously occurred on January in Wageningen (The Netherlands), last Friday, March 10th, Brazilian teams had the opportunity to officially kick-off and engage the competition. Among the 19 Brazilian teams enrolled, 15 are from the State of São Paulo (USP, UNESP, UNICAMP, CTBE and UNITAU), 2 from Rio de Janeiro (UFRJ), 1 from Minas Gerais (UFMG) and 1 from Ceará (UFC). Teams gathered at three sites in São Paulo (UNICAMP, USP and UNESP) and interacted live through a videoconference, while teams that could not be present interacted online. Glaucia Souza from the BIOEN, FAPESP Program for Research on Bioenergy welcomed all the participants and briefly presented the role of BIOEN on R&D and innovation in Brazil. Patricia Osseweijer then presented BE-Basic organization and activities in the world, including actions towards innovation and the organization of the G-BiB competition. Next, each team pitched its idea in a meeting conducted by Patricia Osseweijer live at the USP site and Heitor Cantarella (from BIOEN) present at the UNICAMP site. Each team has the final challenge of writing an innovative business plan, based on a project for the sustainable production of bio-renewable products such as biofuels and biomaterials, or solutions to support the development of these products. To close the meeting, a video was presented to introduce the team competitors on relevant issues to be considered when developing a solid business plan. The video was the same presentation that happened live during the European G-BiB kick-off, performed by Jeroen Veenenbos, from Erasmus Center Entrepreneurship, who gave a number of very interesting examples of business plans which were successful and others which failed. In the next step of the competition, a master class will be offered to the teams, scheduled for May 9th for the Brazilian teams and on April 19th and 26th for the Dutch and German teams respectively, focusing on developing their final business plan to be submitted for the semi-finals. G-BiB competition will offer up to € 10.000 in prizes for the best business project. The overall final will be in São Paulo with the results announced in October at the next edition of the Brazilian Bioenergy Science & Technology Conference (BBEST 2017) in Campos do Jordão. The Kick-off of the first edition of the Global Biobased Business competition (G-BiB) for the German and Dutch teams took place last Tuesday at Wageningen University. This interesting and instructive, but most of all inspiring event marks the beginning of the G-BiB for the two German and five Dutch teams with members from all over the world. After a short welcome, Manfred Kircher (Chairman Advisory Board CLIB2021) inspired the teams to ‘think out of the box’ giving many examples of new feedstock and business opportunities. Kirsten Steinbusch (CEO DAB) presented Delft Advanced Biorenewables, that offers a patented scalable (bio)reactor technology and shared her views on developing her business. A great biotech business example for the students which resulted in many questions and tips. During the kick-off all the teams pitched their idea and motivation under supervision of Patricia Osseweijer. Prior to the event all team were asked to fill in a Sustainable Entrepreneurship Scan, developed by Lisa Ploum (Wageningen University), who also presented the promising results: average score was higher than usual. The final challenge for all the teams is to write an innovative business plan based on a design for sustainable production of biorenewable products such as biofuels and biomaterials or partial solutions that will support developing those products. To give the students an idea about a solid business plan, Jeroen Veenenbos from Erasmus Centre of Entrepreneurship, welcomed the students in the world of business giving them many examples of successful and failed business plans. This was an eye opener and a challenge for many students. The teams will follow a master class in April focussing on developing their business case and by the end of May they will have to submit their business plans. At this moment a similar process is ongoing for the teams in Brazil. The semi-finals for all the country’s will be held in June and the finals in October during the 3rd Brazilian BioEnergy Science and Technology (BBEST) in Campos do Jordão, Brazil. The final award of €10.000,- will be provided for by Corbion to further enrol the business plan.